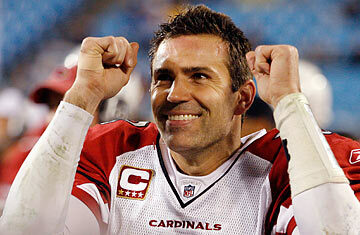 Arizona Cardinals quarterback Kurt Warner celebrates his team's win against the Carolina Panthers in their NFC Divisional Round NFL playoff football game in Charlotte, North Carolina, January 10, 2009. The story of Kurt Warner, who announced his retirement after a 12-year NFL career on Jan. 29, always starts with the chapter in that grocery store in Iowa. For good reason: it's still almost impossible to believe all these years later. In 1994, after the Green Bay Packers cut him  he was the fourth-string quarterback, stuck behind the legendary Ty Detmer  Warner returned to his hometown of Cedar Falls, where the only thing he was throwing was gummy bears. While working the night shift for $5.50 an hour at the local Hy-Vee supermarket, he and his bored co-workers would chuck the gooey candies at each other to pass the time. Maybe gummy gunslinging is an underrated workout plan. Just five years later, after stints in the bushes of the Arena League and N.F.L. Europe, Warner turned in one of the greatest single-seasons ever. He threw for over 4,000 yards, and tossed 41 touchdown passes, while leading the moribund St. Louis Rams to a Super Bowl victory. Warner won the regular season and Super Bowl MVP awards, and two years later, in 2001, he won another MVP while throwing for nearly 5,000 yards. The Rams, nicknamed "The Greatest Show on Turf," reached the Super Bowl again, though they lost to the New England Patriots. In sports, fairy tales are fleeting. Athletes often come out of nowhere, give you a surprising season or two, then take their rightful place back in obscurity. Just three years after his second MVP award, Warner was steaming down this path, and people barely blanched. "Of course," they said to themselves, "a stock boy could never be Brett Favre." Warner started throwing atrocious interceptions, developed a chronic fumbling problem, suffered a bad concussion. Warner was already in his early 30s, that's octogenarian in quarterback years. The Rams dumped him; he signed with the New York Giants in 2004, only to be replaced by rookie Eli Manning midway through the season. The guy was toast. The first act of Warner's drama began sensationally. But it is his second act, often underappreciated, that will put him in the Hall of Fame. After his career stalled with the Rams, his success was explained away: his receivers were so talented and the Rams offense choreographed so beautifully by the coaches that you or I could have put up the same big numbers. Warner would catch on with the Arizona Cardinals, a joke of a franchise, only to lose his job to another heralded rookie, Matt Leinart. But party-boy Leinart wasn't ready to rescue the team, and in '07 Warner revived his career, recording his best statistical season since 2001. A year later, Warner led the Cardinals  yes, those Cardinals  to the Super Bowl, where he would have won another title, and MVP, had the Pittsburgh Steelers not rallied late in the game. This season, Warner's final game wasn't pretty, a lopsided 45-14 loss to the New Orleans Saints two weeks ago. But his penultimate performance will be lauded at his Hall of Fame enshrinement. Warner, who is 38, completed 29 of 33 passes, for 379 yards, in Arizona's 51-45 win over the Green Bay Packers on Jan. 10. He finished the game with more touchdown passes (5) than incompletions (4). Forget about luck. Warner is a winner. He was never the guy who made you drop your sandwich. Unlike Favre, he wasn't the improvisational maestro, or train wreck, that kept you glued to his every move. He never possessed Tom Brady's charisma, or Peyton Manning's overwhelming on-field presence. Still, he is a legitimate part of any discussion involving the importance of those players. He was a surgeon, picking apart defenses with almost flawless accuracy. What else do you need in a quarterback? Off the field, few were better. Warner freely broadcast his deep religious faith, but was never overbearing about it. He is devoted to his seven kids and it's safe to say you will never see Warner caught in any Tiger Woods imbroglio. He is charitable beyond belief. When the Warners go out to eat, they often pick up the tab for a random family sitting nearby. Warner walked away at the right time. Though he hasn't implied that injuries drove his decision to retire  Warner will stop playing with a year left on a $23 million contract  he is no doubt thinking about his long-term health. In December, Warner, who has suffered five concussions in his career, held himself out of a game because his head still felt foggy from a prior hit. Football brain injuries are receiving unprecedented attention right now, and Warner set an important example for millions of kids playing the sport. That's no surprise. Since those days chucking candy in the grocery store in Cedar Falls, Kurt Warner has been an inspiration. See pictures of eccentric college mascots.